Casement Door: The most generally used door type in the world. This kind of door can open inward or outward on a hindge system. They find their application as kitchen doors, terrace doors or internal doors. uPVC doors in general are opted with glass on the major section but for internal purposes they can be opted with uPVC or PU foam sheets which are equally durable & maintenance free. Sliding Door: Sliding doors slide on rollers and can be with or without threshold (lower frame) they can be used for larger spaces such as floor to ceilling enclosures, internal partitions or office cubicles. It spares a lot of space since the panels do not open outward or inward but just slide on the track. They give uninterrupted view when used as part-ions. To give them a more pleasing look Cora has introduced georgian bars that can be installed as an clip on accessory. Lift and Slide: These have a similar design an orientation as normal slider doors but instead of sliding on the rollers they glide over it giving a much better & smoother operational experience. 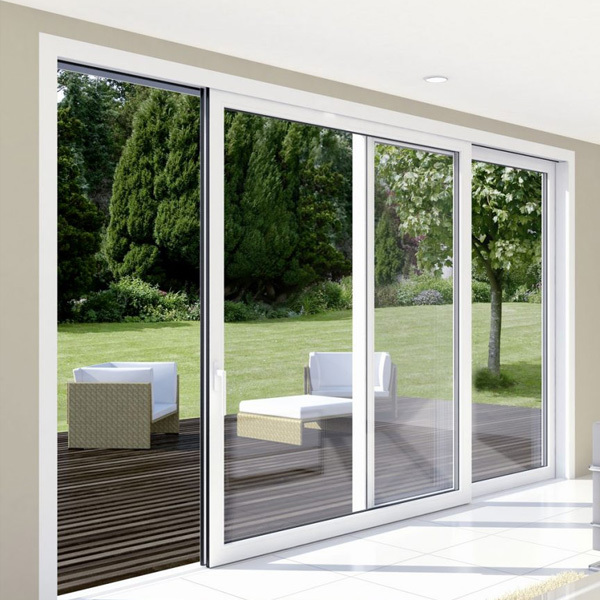 Slide and Fold: Slide & fold doors slide on rollers and then are folded to one side giving you a complete opening as and when required. These doors can be used for open terraces or bigger halls or as glass partitions. Rotating: These are majorly used in business spots and workplaces. They are rarely utilized at homes. They have four wings or panels for individuals to pass through. They have proved to highly efficient for commercial spaces & places with higher foot fall as they do not have any outer frame above the floor level lessening the chances of tripping over. Next Post Security Concern? Worry No More!